On December 15, 1890, legendary Hunkpapa Lakota (aka, Teton Sioux) leader and holy man, Sitting Bull, was killed by Indian Agency Police at Standing Rock Indian Reservation in the Grand River area of South Dakota. Indian Agents feared Sitting Bull would be leaving the reservation in order to supervise a “Ghost Dance” ritual that agents feared could result in unrest and rebellion among the Native American tribes already on reservations. An early morning arrest had been ordered to surprise Sitting Bull and his followers, and a total of 39 Indian Agency Police officers and 4 additional volunteers set out to arrest the great man. Intending to take Sitting Bull to Fort Yates on horseback, the arrest went awry as irate tribesmen resisted the arrest of Sitting Bull. Gunfire erupted, and Sitting Bull was dead at the age of around 58 or 59 years. Sitting Bull had led an illustrious life and had become one of the most famous and revered of the Native American leaders. He had been born in the same Grand River area in which he died, originally given the unlikely name of Jumping Badger, later earning the nickname “Slow.” (“Húŋkešni” in Lakota.) For his exploits as a warrior as a teenager, Jumping Badger was given the name Buffalo Bull Who Sits Down as a mark of distinction, shortened to the familiar Sitting Bull. In 1862, disgruntled Native tribes in the Dakota Territory (not including the group Sitting Bull was part of) began raiding White Americans, triggering the Dakota War of 1862. The US Government did not let the distraction of the American Civil War that was then raging deter them from sending the US Army to punish the offending Native Americans for killing somewhere between 300 and 800 White settlers. Unfortunately, to the Army, most of the Indians pretty much looked the same (that is, guilty) and the soldiers ended up killing some innocent bands including members of Sitting Bull’s band in 1864. Sitting Bull in turn led a party of about 100 warriors against a White detachment from a wagon train that had been left behind to repair disabled wagons. In the skirmish Sitting Bull was shot in the hip with a “through and through” shot that went out the small of Sitting Bull’s back. Sitting Bull recovered from this wound. Sitting Bull had become an enemy of the White Americans and engaged in all sorts of raids and battles after the Dakota War of 1862, including Red Cloud’s War of 1866-1868 and the Great Sioux War of 1876, including raids and other battles in between. The attempt to put railroads crossing Lakota land generated resistance from Sitting Bull and his band, among other Native American tribes, and when the Black Hills Gold Rush of 1874-1877 brought increased amounts of Whites to the land the Lakota held sacred, violence was the only relief the Lakota had to retain possession of their land. The Lakota Wars (1854-1890): The battlefields and the Lakota treaty territory of 1851. Most battles “between the army and the Dakota [Lakota] were on lands those Indians had taken from other tribes since 1851”. Ewers, John C.: “Intertribal Warfare as a Precursor of Indian-White Warfare on the Northern Great Plains.” Western Historical Quarterly, Vol. 6, No, 4 (Oct. 1975), pp. 397-410, p. 408. Stands In Timber, John and Margot Liberty: Cheyenne Memories. Lincoln and London. 1972, p. 170, note 13. It was during the Great Sioux War of 1876 that the infamous Battle of the Little Bighorn took place, often better known as “Custer’s Last Stand,” in which a US Army Cavalry detachment led by Lieutenant Colonel George A. Custer was wiped out by a large Native American fighting force consisting of multiple tribes (nations), including the Sioux and Cheyenne, including tribesmen represented by Sitting Bull. It had been Custer himself, formerly a Brigadier General (Brevet) during the US Civil War, who had passed word of the finding of gold in the Black Hills in 1874 that triggered the gold rush, and ultimately his own fate. 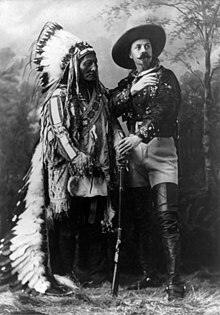 The US Government had given the Army directions to round up all Indians living off the assigned reservations and it was to this purpose that Custer and his men had set out to accomplish, knowing that peaceful resolution was hopeless. Sitting Bull had a famous vision during the religious ceremonies preceding the battle in which he saw the Native Americans as victorious. Next on Sitting Bull’s dance card was a stint as an attraction in the Buffalo Bill Cody’s Buffalo Bill’s Wild West Show in 1885. The great Chief would ride a lap around the performance area and be paid $50 per week, a decent though not overwhelming amount of money in those days (about $1400 in today’s dollars). 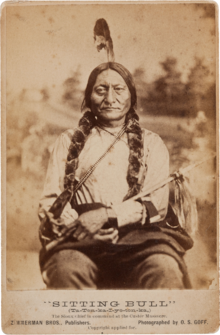 A much greater source of revenue for Sitting Bull was derived from posing for photographs with show goers and providing autographs. He is reported to have given much of the money he thus earned to needy people. Sitting Bull’s career in entertainment lasted only 4 months, and he returned to the reservation. In the ensuing few years, tensions between Sitting Bull and the head of the Indian Agency at Standing Rock/Fort Yates, James McLaughlin, resulted in anxiety by the White Americans about the possibility of an Indian uprising, especially one that might be called for by a leader of Sitting Bull’s stature. The Native American practice of the Ghost Dance brought adherents to the Standing Rock Reservation and these mystic Native Americans were welcomed by Sitting Bull. Word that shirts blessed by the holy men among the Ghost Dancers would be able to stop bullets emboldened the more belligerent Indians and caused fear among the White authorities. These developments caused McLaughlin to order the arrest of Sitting Bull, resulting in the previously described killing. It seems a shot fired by a Native American at the officer in charge of the arrest party, a Lt. Bullhead, triggered the melee and killing. The Lt. was hit, and he attempted to shoot Sitting Bull in the chest, striking the noble elder with a serious wound. A second Indian Agency Police officer named Red Tomahawk also shot Sitting Bull, this time in the head. Sitting Bull died of these wounds a few hours later. A total of 6 of the Indian Agency officers were killed in the battle as were 7 of the Native Americans from the reservation. In 1953, descendants of Sitting Bull removed his body from its burial place at Fort Yates and reinterred his remains at Mobridge, South Dakota close to where he had been born. Only 2 weeks after the death of Sitting Bull the US Army brutally suppressed the Ghost Dance movement by massacring 150 (or more) Native Americans involved in the movement at Wounded Knee, South Dakota. Questions for Students (and others): Do you think of Sitting Bull as a Great American? How do you rank him among the great/famous Native American leaders? Did you know Sitting Bull performed with Buffalo Bill and his famous show? Did you know it was actually Native Americans that fired the shots that killed Sitting Bull? Philbrick, Nathaniel. 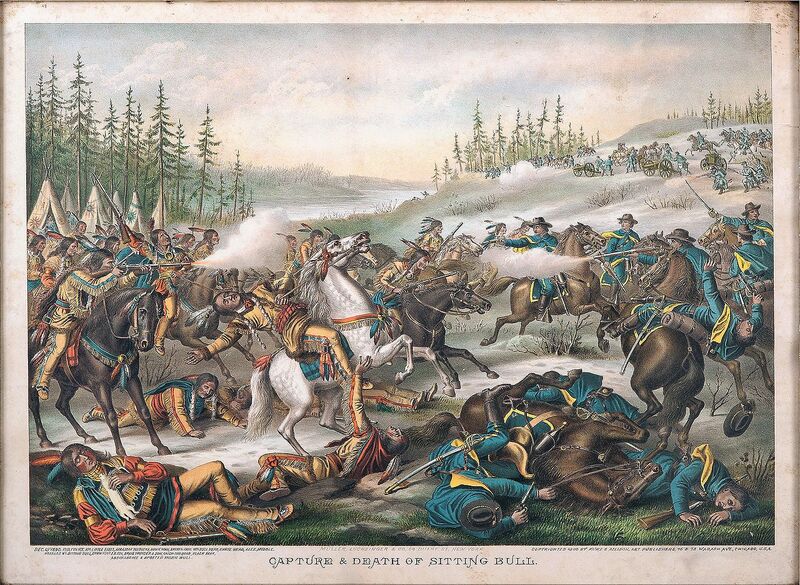 The Last Stand: Custer, Sitting Bull, and the Battle of the Little Bighorn. Penguin Books, 2011. Utley, Robert. Sitting Bull: The Life and Times of an American Patriot. Holt Paperbacks, 2008. The featured image in this article, an 1890 hand-colored lithograph by Kurz & Allison of Chicago from Cowan’s Auctions of the capture and death of Sitting Bull, is in the public domain in its country of origin and other countries and areas where the copyright term is the author’s life plus 70 years or less. Previous ArticleDecember 14, 1992: Where in the World is Abkhazia?